A busy time in Riocentro Pavilion 3 at the Rio 2016 Olympic Games; it has been the very same in other parts of the campus. Not only has the practice hall been full of activity as players prepare for forthcoming matches; additionally, the entrance to the building has seen plenty of action; the standard of play may not be quite that of those who extol their skills in the main arena but it is fun. Encouraging those coming to watch the stars has been the order of affairs. Come and try sessions, with coaches from the Brazilian Table Tennis Confederation advising, are being staged from 9.00am to 3.00pm each day. Immediately following, various games for children are organised with a one hour session from 4.00pm to 5.00pm involving worthy Olympians concluding the afternoon. 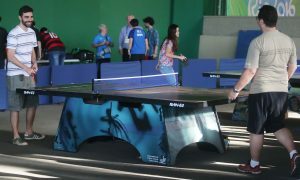 Notably such names as the host nation’s Hugo Calderano and Belgium’s Jean-Michel Saive have attended with members of staff from the International Table Tennis Federation playing major roles; both Polona Cehovin Susin, ITTF Director – Education and Training and Michael Brown, ITTF Africa and Oceania Co-ordinator have been present. On Thursday 11th August, the staff member was Leandro Olvech, the ITTF Director-Development, the star name was the host nation’s Gui Lin, her advice was particular appreciated by nine year old local girl Maryanna Lago who lives in nearby Fluminese. Most certainly she was enjoying both playing and watching table tennis. I like everything about table tennis. It’s fun to play and in the hall it’s really good with everyone cheering and clapping; it’s exciting. Maryanna Lago. Now that is music to my ears; I really think we do ourselves no favour at all in promoting the sport by using the words ping or pong, the image portrayed is that of the kitchen table not an athletic sport. A vast range of abilities has been present, making one fact; table tennis is the sport for all!